Laser Hair Removal for the first three sessions. Remove trouble spots with long-lasting effects. A complimentary patch test is required before the procedure. Here at Top1One in Richmond, London, we aim to enhance your natural beauty and achieve maximum results with our safe and virtually painless laser hair removal treatments. As we believe your skin always deserves the very best, our highly experienced therapists use nothing other than the award-winning Soprano Ice Platinum System to remove your unwanted hair. By using the most advanced technology and lasers available, we are able to treat all skin tones and hair types and offer discreet hair removal therapy for both men and women. If you’re new to Top1One beauty salon in Richmond, you’ll get 50% off your first three laser hair removal treatments and 20% off all further sessions when you quote “TOP7.” The discount code must be used at the time of booking. Top1One uses the Soprano Ice Platinum because it delivers a massage-like sensation and is the ONLY clinically proven laser hair removal treatment that is virtually painless. This system combines 3 laser wavelengths that operate simultaneously from just one innovative handpiece to target different tissue depths and anatomical structures within the hair follicles. Not only is the Soprano Ice Platinum the safest laser hair removal treatment available but it’s also suitable for all skin tones, hair types and any area of the body. Many people often assume that Soprano Ice Platinum is a laser hair removal treatment designed for only women who no longer want to shave, wax or bleach away their unwanted body hair – but this simply isn’t true. Soprano Ice Platinum is, in fact, popular with both men and women who want to invest in a permanent hair removal solution that leaves their skin hair-free and silky smooth. It’s ideal for the widest range of skin tones and hair types and is even extremely effective for sensitive and embedded hair areas, such as the upper lip and bikini line. We use the revolutionary Soprano Ice Platinum laser hair removal system because it allows us to remove hair from any area of the body, as well as treat large areas in less time. From the most commonly treated areas such as legs, back, upper lip, underarms and the bikini line to other areas of the body including fingers, shoulders, buttocks and the neck, Soprano Ice Platinum provides the very best results for men and women. This means we have a treatment suited to every concern, and even offer full body treatments to leave you hair-free from head to toe in our Richmond, London beauty salons. 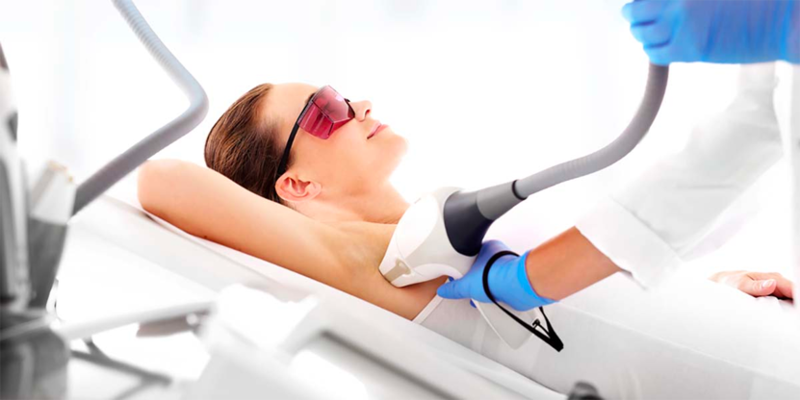 Prior to your first laser hair removal treatment at our Richmond salon in London, you are required to book a free consultation so that you can discuss your objectives and we can check your medical history. A patch test is then carried out on your skin to enable your dedicated therapist to determine your suitability for laser hair removal and which laser settings are required for your skin and hair type. During the laser hair removal procedure, the Soprano Ice Platinum applicator will deliver a high repetition rate of short pulses to the dermis (the inner layer of skin). 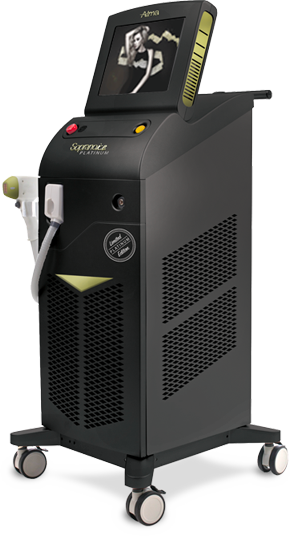 Soprano Ice Platinum incorporates Alma Lasers SHR method, which works by heating and damaging the hair follicles to prevent re-growth while avoiding injury to the surrounding skin for safe and comfortable hair removal. We have performed many laser hair removal procedures on men and women in Richmond, London. Here are just some of our before and after pictures to showcase the real, lasting results that the Soprano Ice Platinum System can achieve. How many laser hair removal treatments will I need in order to see results? Is it necessary for me to do anything before a treatment? Soprano Ice Platinum offers the fastest laser hair removal solution, and you can return to everyday activities straight after treatment. The duration of your sessions will depend on the area being treated, as well as your skin colour and hair type. Smaller areas such as the upper lip and fingers usually take only a few minutes or less, and larger areas such as back and full legs can take up to 20 minutes. If you’re tired of shaving, waxing or bleaching and want to save time and money on getting rid of unwanted hair, Soprano Ice Platinum laser hair removal is the treatment for you! Simply download our app or call us on 0208 940 6111 to book your free consultation at our Richmond beauty salon. And if you’re new to Top1One, don’t forget to quote “TOP7” to get 50% off your first three laser hair removal sessions.